Ongoing support and management of your printing workflow—saving your school time, money, and headaches. In the digital age environment, printing and imaging technology is designed for the convenience of providing hardcopy when you need it. In education, you print it when you need it; not weeks, days, or even hours in advance. 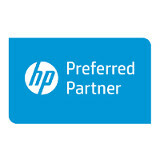 You need dependable and on-time printing and imaging now, not tomorrow. 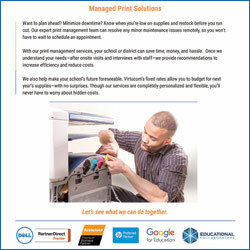 With our print management services, your school or district can save time, money, and hassle. Want to plan ahead without having to stop and think about it? Know when you’re low on supplies and restock before you run out. Looking to minimize downtime? Our expert print management team can resolve any minor maintenance issues remotely, major onsite maintenance needs, and re-supply you with toner, including installing it for you, so you won’t have to stop to schedule an onsite appointment, when you need to be printing instead. We also help make your school’s future foreseeable. Virtucom’s fixed rates allow you to budget for next year’s supplies—with no surprises. Though our white-glove services are completely personalized and flexible, you’ll never have to worry about hidden costs. Our process begins with an in-depth evaluation of your printing and imaging systems, including technology, methods, and storage. Once we understand your needs—after onsite visits and interviews with staff—we provide recommendations to increase efficiency and reduce costs. Virtucom performs preventative maintenance and prepares your printing environment for potential challenges. For example, we can implement multifunctional systems to moderate device counts in locations with varying usage rates. We provide ongoing support for your printing workflow, managing every aspect from networks to hardware and supplies. Contact us today to learn how predictable your print management can be.